Schools in England are having to "pick up the pieces" for families in poverty, including giving food and clothes to children, head teachers warn. But, they say, that is unsustainable when schools are facing "funding cuts". Heads will raise their concerns at the Association of School and College Leaders' (ASCL) annual conference. Education Secretary Damian Hinds will tell the conference he is setting up an expert advisory group to help teachers with "the pressures of the job". The advisory group, including the mental health charity Mind and teachers' representatives, will look at ways to improve wellbeing among teachers and to tackle stress. 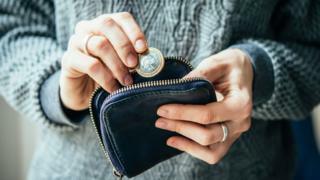 But the head teachers' conference in Birmingham will hear complaints that pressure in school is being exacerbated by inadequate levels of funding. Many schools face "severe cuts", says ASCL general secretary Geoff Barton, but they are still expected to be an "unofficial fourth emergency service for poor and vulnerable children". "A decade of austerity has wreaked havoc with the social fabric of the nation and schools have been left to pick up the pieces," says Mr Barton. He accuses politicians of having a "fixation with Brexit" while failing to address the struggles of impoverished families and the lack of investment in schools. Sarah Bone, head teacher of Headlands School, in Bridlington, says she sees "too many children with no heating in the home, no food in the cupboards, washing themselves with cold water, walking to school with holes in their shoes and trousers that are ill fitted". Edward Conway, head of St Michael's Catholic High School in Watford, says: "Pupil poverty has increased significantly over the past eight years, with us providing food, clothing, equipment and securing funds from charitable organisations to provide essential items such as beds and fridges." The head teachers' union has canvassed the views of school leaders, whose comments include: "When schools have to buy shoes for children to wear to school on a regular basis, we must have a problem." Another head said: "In 24 years of education, I have not seen the extent of poverty like this. "Children are coming to school hungry, dirty and without the basics to set them up for life. "The gap between those that have and those that do not is rising and is stark." Head teachers have been campaigning over school budget shortages - with claims of fewer staff, bigger classes and teachers having to carry out support tasks, even cleaning the toilets. "Like any really important job, teaching comes with its own challenges and, whilst rewarding, I don't need to tell you how stressful it can be," Mr Hinds will tell the conference. "As a society, there is a much greater level of understanding about mental health and wellbeing and it is something many of you raise with me when I visit your schools. "Whilst those conversations are focused on supporting your students, I'm clear that your wellbeing is also something we need to prioritise." Paul Farmer, chief executive of Mind, says: "Mental health problems at work are common in all workplaces - and although we have made great strides, mental health is still a taboo subject. "The first, and arguably most important, step will be to start a conversation about mental health that empowers teachers and make sure they have access to the right training and guidance to support themselves, their colleagues and their students."